When it’s cold and snowy during the winter, many of us respond by staying inside and hiding underneath a pile of blankets. But how do animals cope with the cold? It turns out that for some species the solution isn’t warming up— it’s cooling down! So what do we mean? Some animals can “supercool” their bodies to temperatures below freezing. One exceptional example is the arctic ground squirrel— a small hibernating mammal that lives in Alaska, Canada, and Siberia. When arctic ground squirrels go into hibernation, they can cool their bodies to temperatures as low as – 2.9 degrees Celsius (26.7 degrees Fahrenheit) without freezing their blood or their organs. Supercool ground squirrels have to survive hibernations lasting as long as 8-10 months in burrows that can be as chilly as -18 degrees Celsius (-0.4 degrees Fahrenheit). By dropping their body temperature below freezing they can burn less energy, which may allow fat stores to last longer for the long Arctic winters. Other animals have an more extreme method for dealing with cold in the winter: they can actually survive being frozen! The wood frog, which is found throughout northern North America, is one such species. Laboratory tests suggest that at various points during the winter as much as 65% of the water in the frog’s body can be frozen. When frogs are frozen everything in the body stops— even the heart! The trick for surviving this icy challenge seems to be in controlling how ice forms in the body. Typically, wood frogs start to freeze after coming into contact with an ice crystal in the environment, so freezing starts from the outside and works inward. As frogs freeze, they dehydrate their organs and concentrate body water in their abdomen. This helps limit the number of ice crystals that form in between cells. Even though ice can form between cells, it doesn’t form inside them— that would be fatal. Frogs have one other safety trick up their sleeves: as they freeze glucose streams out of the liver and distributes itself around major organs. Here it acts as a cryoprotectant, that ensures that the heart, lungs, and stomach don’t get hurt by all of that ice. For wood frogs, freeze tolerance is crucial for winter survival. Since they are ectotherms, they can’t stay warm by generating their own heat. Wood frogs get some protection from harsh conditions by burying themselves in leaf litter during the winter, but that’s not enough to stay above freezing. 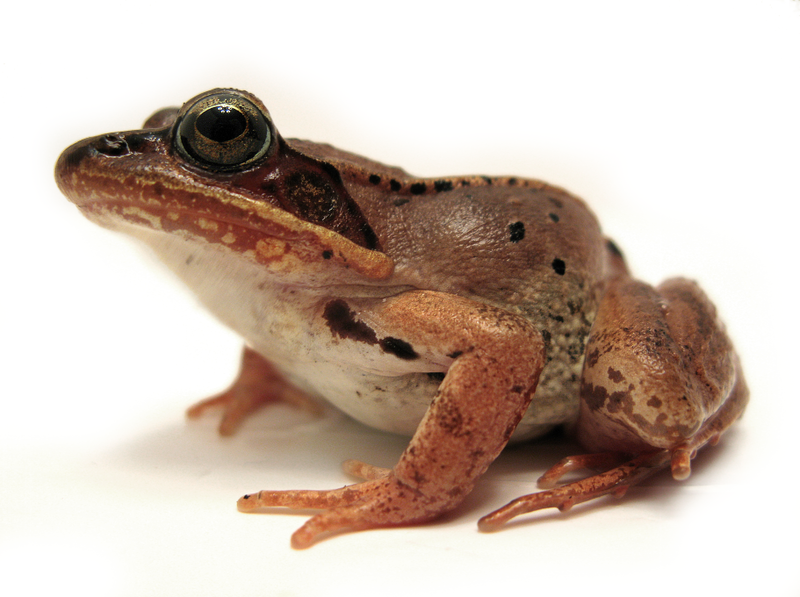 By evolving special adaptations to survive being frozen, wood frogs can endure the arctic without any of the wool hats and down jackets that humans need. Barnes, BM. 1989. Freeze avoidance in a mammal- Body temperatures below 0 degrees C in an arctic hibernator. Science. 244: 1593-1595. Storey KB and JM Storey. 1992. Natural freeze tolderance in ectothermic vertebrates. Annual Review of Physiology. 54: 619-637.